White Oaks is the perfect, 2 bedroom 2.5 bath cabin with a generously sized loft that accommodates two queen beds and a 32' flat screen TV. This beautiful retreat can comfortably sleep 8. Upon entering the cabin, you will find an open and airy living space with ample seating including two full size leather sofas, a gas fireplace (October 1st -April 1st) to snuggle up and enjoy a movie night on the 42' flat screen TV. The kitchen, is fully equipped to ensure all the comforts of home. White Oaks cabin has the added convenience of a laundry closet complete with a full size washer and dryer. Enjoy your morning cup of coffee on the wrap around deck swings or rocking chairs and let the bubbling seasonal creek help you escape from your busy life. There is plenty of flat land to walk around the property and gather around the outdoor fire pit, tell stories and roast marshmallows. You can go on mini adventures within the property and surroundings and discover hidden caves and creeks. If the dates you desire are booked, or you are looking for a cabin that sleeps 6, check out our other cabin “ Red Maple” with a similar floor plan and equal tranquility with breathtaking mountain views and a hot tub at vrbo.com/1531063. We are a normal family that loves the mountains. We are from Florida and every year we enjoy creating beautiful memories with our children in the Great Smoky Mountains. Location, location, location! 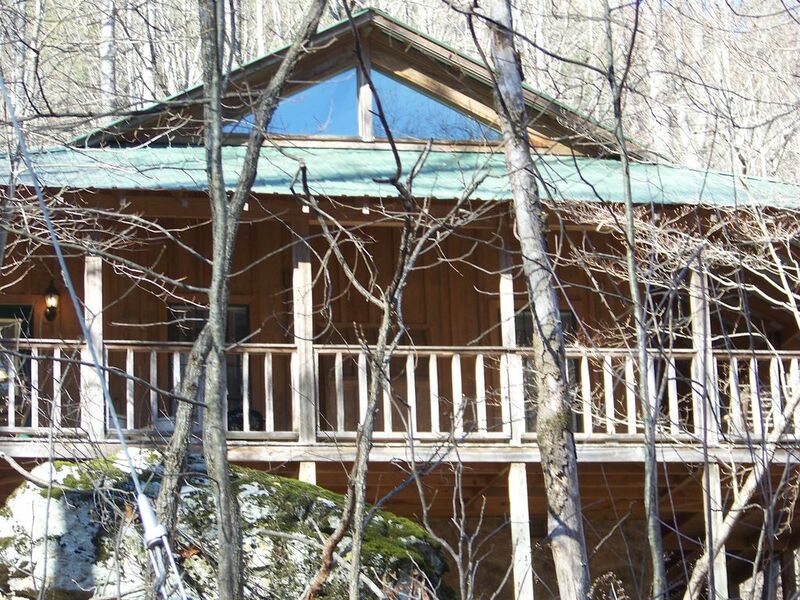 This cabin is conveniently located to all attractions/shopping in the Pigeon Forge area and only minutes from Gatlinburg and Townsend. From the swings on the front porch to the caves and creek surrounding the Property make it a very unique place to explore. The cabin telephone number is 865-446-4641. The fire place is only operational October 1st - April 1st. Free wi-fi internet is provided. There is no password required, simply select the “whiteoakscabin” router. There is a ramp into the cabin, but the cabin has not been adapted for wheelchair use. Nice cabinet, unfortunately it rained all weekend so we didn’t get to enjoy the fire pit. Beautiful cabin with lots of room! Everything was PERFECT, I have stayed at many cabins but this one was above standards...with the extras....cleaning products, lotions, soap pumps, spices etc. This will be my cabin from here on out. Thanks for allowing us to stay at your cabin! Everything was great and not to far from attractions! This was our first time visiting and we will definitely be back!! !